You don't need to learn any HTML or web design coding to create a music website using Easysite. Are you a musician or singer and want to enchant more and more people with your tunes and/or songs? 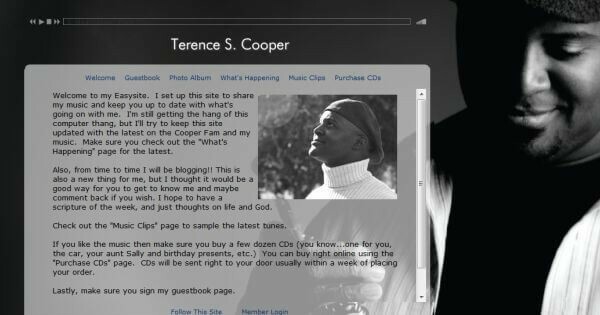 You can with your own music website like Terence Cooper. 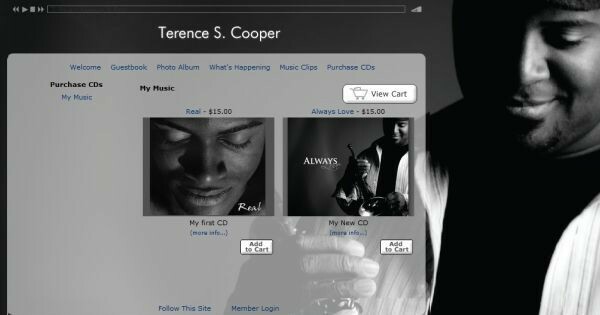 Below is the music website of Terence Cooper made using Easysite, click here to visit his site. Terence even made a testimonial video of how easy he found building a website was using Easysite you can see the video on our testimonials page and if you get stuck watch our how to create a website video tutorials and see how it all works and how easy it is to build your own website. most people are online and if you want to reach out to a large audience, you need to create a music website of your own. A music website where people can check out snippets of the music that you create or download free samples or purchase your albums is a great way to promote your works. You can even do a email blast when new songs are released. Creating a website doesn’t require you to sign up for any web design course or take a large chunk of time out of your hectic schedule. We, at Easysite, let you create a music website all by yourself in very little time and without spending hundreds of dollars. You can create your music website for less than $20.00 a month. That's right you get all the features included and never have to upgrade, we even give you the best eCommerce software that you can use to sell products off your site, fast reliable hosting, and a free domain when you sign up with us. But first we want you to try our complete system free for 30 days and see why its called Easysite. Click here to start your free trial. Here are a few reasons why we feel you would love spreading the buzz about your tunes with our help. Start by taking advantage of our 30 day free trial and create a music website in the comfort of your home, office or music studio. Why Should You Work With The Easysite Team? You are happy creating music and don’t have much time for anything else, let alone learning how to create a music website. If you decide to create a music website with our help, you do not need to learn any programming language or have any web design skills. You do not need to understand how to install software. You just need to know how to type a few good sentences on a computer, have internet and sign up to Easysite. You do not need to worry about anything else – our easy to use site builder does all the coding for you. You have a recording soon, you need to rework that tune, we understand that you have a packed schedule and that creating a website is not your full time job. Just spending a few hours every day will help you create a music website for yourself or your band in a few days. And the one you create won’t be an amateurish one. We will help you create a professional, beautiful website that reflects your creative mind and wows your audience as much as your tunes do. You do not need to spend much on creating a music website. Our services are very affordable and what’s more, we offer you a free domain name after the initial site payment. You can keep this domain name for your entire lifetime. You can use this domain name even if you, for some reason, decide not to work with us anymore. This is the age of mobile technology, and your site is either responsive or dead. No matter which device your audience uses for accessing your site, your site will look awesome and get people hooked from the very first moment when you use Easysite.com. Linking your or your band’s Facebook or Twitter profile to your website can help you pull in more people. We help you link your social media profiles to your website without you needing to get in touch with any other professional web developer. Its a piece of cake to add social network buttons to your site. Watch this YouTube video on how easy it is to add social network buttons on your site. There is no point in having a website if it doesn’t show up in search engine results. We, at Easysite, get this completely and our software creates every site in such a way that they are readily indexed by prominent search engines. When your songs gain popularity, the number of visitors to your website will go up. You can enjoy your moment of fame without worrying about your site going down. Our reliable web hosting services ensure your site stays up and running, round the clock. even while you are on the move. Now isn’t that very easy? Our service charges are very affordable too. If you want us to build a website for you we can quote a price, call us at 877-832-7974 or email us - help@easysite.com. So where do you start? Below we give you a basic idea of how easy the process of creating a music website can be, when you sign up to Easysite, the easy to use website builder. 1. Log on to www.easysite.com or click the green CREATE YOUR WEBSITE button top right of this page. Fill up the form by entering the key details that are asked of you, such as your full name, your email address and your phone number. You also need to choose a password for the site that is about to be created. 2. Next, you need to confirm that you are 18 years old or more and that you agree to our terms of service by ticking the checkbox in the form. You can read the terms of service by clicking on the link specified for this. 3. Next, click on the ‘Get started’ button. You will be taken to your new music website. Here you can add new features to your website by clicking on specific features. 4. You can also let your fans or audience purchase your tunes or songs by adding a shopping cart to your music website. Still in two minds about working with us? May be a chat will help you decide sooner! We are just a call away at 877-832-7974. You can also write to us at help@easysite.com. Rest assured – we will get back to you in no time!